iSE | iSE | FUSE Start-up Summer Camp – Open for Applications! 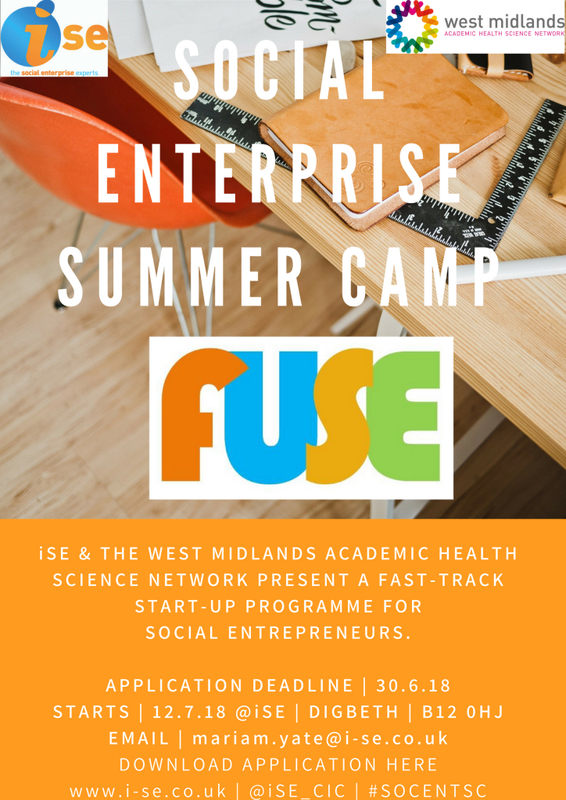 iSE | FUSE Start-up Summer Camp – Open for Applications! What is the FUSE Summer Camp? iSE run a number of different FUSE social enterprise start-up programmes throughout the year. The programmes are for people who want to develop a business that is financially sustainable but also (and importantly) delivers a strong and measurable social impact. Our Summer Camp is for social entrepreneurs, innovators and change-makers near trade or at early-start stage that want to fast-track their social enterprise, grow networks, develop collaborative opportunities and develop sustainable businesses that create social impact. We’ll work intensively over a period of six weeks, supporting you through group pow-wow sessions which will be practical and focused around developing your social enterprise. Topics we cover on the programme include the business model canvas, developing a robust social mission, building a community and networks, social media and marketing, understanding numbers, funding and alternative social finance, social impact and developing your pitch. Camp will take place every Thursday from the 12th of July through to 30th August. Timings are TBC depending upon the group – either afternoons or evenings. There may be other events that fall outside of the programme that you can attend, and these events may be shared with people from other programmes. FUSE doesn’t happen by itself and iSE works with a number of funders and sponsors who understand the power that social enterprise can have in changing lives and communities. Because of our sponsorship, The Fuse Summer Camp programme is free to you. You will be receiving the equivalent of £1,500 of business support. We therefore ask that you agree to attend all the sessions and complete the programme. The programmes whilst delivered at no cost to yourself are paid for by our sponsors and funders and are always oversubscribed. Due to the collaborative nature of the programme it is impossible to bring in “substitutes” later. FUSE is a programme that grows, changes and learns so please help us with that. We will be asking you to fill in simple evaluation sheets at the end of each session and at least once in every programme another iSE team member will ring you to check how things are going. We ask that you complete an application form by the closing date of the 30th June 2018. If shortlisted we’ll then invite you for an interview (in person or by Skype) week commencing 2nd July 2018.
iSE is a social enterprise itself that has been trading successfully and supporting the social business sector in Birmingham and the West Midlands for the past 15 years. Our small team led by our CEO Sarah Crawley are passionate around how the value created by social enterprise can drive change in our local communities … we are pleased to be working with you and wish you every success!